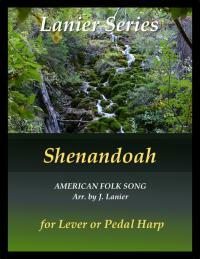 Many of the Shendandoah harp arrangements use full four-note chords but if you love this song as much as I do and need a simpler yet full-sounding arrangement, you might like this one. It has a simple first half and then only three-note chords when it becomes fuller. This arrangement has no lever or pedal changes.